This study, by focusing on road construction projects in Japan’s local governments, conducts an empirical analysis of the relationship between the issuance of extraordinary local road improvement project bonds (subsequently abbreviated as “road bonds”) and the rate at which the redemption of the principal and interest on these bonds factors into standard financial needs (subsequently abbreviated as “inclusion rate”). Furthermore, it analyzes whether the value of local road bonds approved varies with the inclusion rate. Our analysis indicates that road bonds can be said to be linked to national treasury grants even if there exists a local allocation tax measures that allows for the redemption of the principal and interest on local bonds because local specified road maintenance and improvement projects (subsequently, “the specified projects”) combine local public subsidized projects and local public non-subsidized projects. In Japan, from the end of the 1980s to the beginning of the 2010s, the value of non-subsidized works that were conducted by local governments at their own expense and without receiving national treasury grants[i] exceeded the value of subsidized works. It is said that the financial support measures on non-subsidized works had provided a strong incentive for the implementation of non-subsidized works. In other words, the local bond redemption money for the principal and interest has factored into standard financial needs for local allocation tax grants (subsequently abbreviated as the “local allocation tax measures”). Typical examples of local bonds with local allocation tax measures are extraordinary local road improvement project bonds (subsequently abbreviated as “road bonds”). Road bonds have a “general portion” without local allocation tax measures and a “specified portion” with local allocation tax measures. Figure 1 shows that since the second half of the 1990s, the general portion decreased and the specified portion increased. The following research on these topics is cited: Nakano (2000), Doi and Bessho (2005a and 2005b), Bessho (2008), and Hayashi and Ishida (2008) performed analyses using econometric methods. Nakano (2000) and Hayashi and Ishida (2008) used costs of non-subsidized works as the response variable. 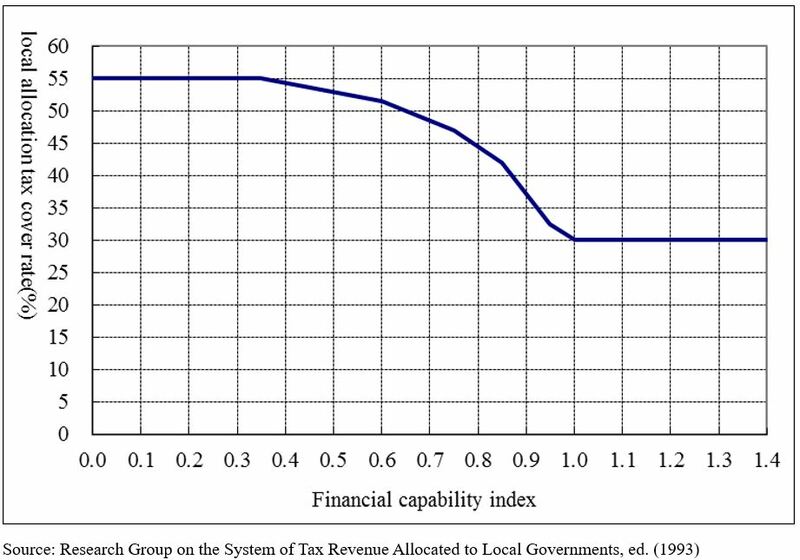 Bessho (2008) used public investment value and local bond issue value to investigate the effects of local allocation tax measures. 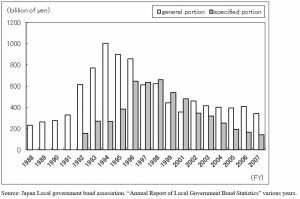 Each of these previous studies concluded that local allocation tax measures increased the spending on non-subsidized works and the issuance of local bonds. This study focuses on prefecture road projects and empirically analyzes the relationship between the issue of road bonds, for which local allocation tax measures were implemented, and the inclusion rate of redemption money for principal and interest in the standard financial needs (subsequently, abbreviated as the “inclusion rate”). In this study, we clarify whether differences in the inclusion rate caused differences in the value of road bonds issued by local governments. Our findings indicated that local governments which could issue local bonds with a high inclusion rate do not always issue local bonds. Rather, local allocation tax measures were linked to subsidized works. The focus was on road projects, because they are the largest infrastructure investment. Road bonds are a good example of local government bonds for which the local allocation tax measure was implemented for the redemption of principal and interest. By focusing on these bonds and by directly verifying the relationship between local allocation tax measures and bond issuance, the effects of local allocation tax measures can be clarified in detail. Road bonds have already been discontinued. However, once again clarifying the actual conditions of local bonds, for which local allocation tax measures were implemented, might provide important clues about the best ways to conduct Japan’s intergovernmental fiscal relations. This paper is structured as follows: Section 2 provides an overview of the road bonds system. Section 3 explains the verification model, elucidates the data used for the analysis, and provides estimation results and their interpretations. Finally concluding remarks follow in section 4. Figure 2 shows the relationship between the inclusion rate for principal and interest redemption, such as for the road bonds specified portion, and the financial capability index. [v] When the financial capability index is 1.0 or higher, the inclusion rate becomes 30% and increases with the financial capability index. When the financial capability index is 0.35, it becomes 55% and remains 55% even when the index falls below 0.35. After FY 2002, local allocation tax measures were reviewed and corrected, and the inclusion rate became 30% irrespective of the financial capability index. In this section, the relationship between road bonds and the inclusion rate is empirically analyzed and whether differences in the inclusion rate resulted in differences in the value of road bonds issued by local governments is clarified. The effects that local allocation tax measures had on the issuance of road bonds were verified using an analysis of panel data. In this paper, using the value for prefecture-level road bonds approved as the explained variable. The following model was assumed. Here y is the value for the local specified portion of the road bonds approved, r is the inclusion rate, g is the national treasury grants for the cost of roads and bridges, i is the investment capacity(= 100 minus the ordinary balance ratio), b is the bond issuance limit ratio, is time-specific effects, is unobservable individual-specific effects, and is the error term. The value of road bonds approved and the national treasury grants were standardized by dividing them using the standard financial scale. is a coefficient warranting particular attention, because it shows the relationship between the value of road bonds approved and the inclusion rate. The estimation period was from FY 1993 to FY 2007 (excluding FY 2000). Tokyo and Okinawa Prefectures were omitted, because the road bonds issuance value was small. The data were considered to be panel data. Estimates were conducted from FY 1993 and continued FY 2007. This was because the specified portion was created in FY 1992, and in FY 2008 projects targeted for road bond issuance were expanded. The data on road bonds, and the explanatory variables for FY 2000, were excluded because no data was published in that year. Next, we describe the explanatory variables and expectations for the signs of the various coefficients. The inclusion rate of 30%–55% in the standard financial needs was used, calculated from the prefectures’ financial capability index. As aforementioned, because the inclusion rate was reviewed and corrected after FY 2002, the inclusion rate became 30%, irrespective of the financial capability index. However, the inclusion rate became 0% for prefectures not receiving local allocation tax grants. Although previous studies concluded that the inclusion rate has a positive impact on the issuance of road bonds, Coronado (1999) verified that tax-exempt local government bonds subsidized states’ capital expenditure in the United States. This study empirically considered that a tax exemption increases capital expenditure, thus concluding that it depends on the specification of the model. The reason for using the national treasury grants as the explanatory variable is that, as previously explained, the issuance of road bonds and the implementation of local specified projects combined subsidized projects and non-subsidized projects. Therefore, if the national treasury grants increases, the issuance of road bonds also increases. The reason for using investment capacity as the explanatory variable is that financial resources affect the issuance of road bonds. Shizuoka Prefecture edited a document in 2003 showing that general financial resources could be allocated to investment spending, as “100 minus the ordinary balance ratio ＝ investment capacity.” We expect it to have a positive impact. The bond issuance limit ratio shows the rigidity of fiscal management. 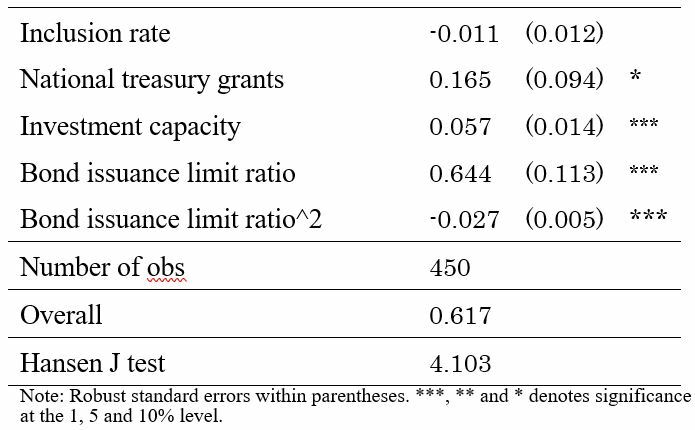 Nakano (2000) used data on municipalities and estimated that the bond issuance limit ratio’s coefficient of primary term was positive while the coefficient of quadratic term was negative. He interpreted the results as indicating that when the bond issuance limit ratio does not exceed 15%, local governments control non-subsidized works comparatively freely. [vi] Nakano took into account nonlinearity; therefore, we hypothesize that the statement “when the bond issuance limit ratio reaches a certain level, local governments reduce their issue of road bonds” is incorporated into the model in a verifiable form. [vii] Therefore, the bond issuance limit ratio’s coefficient of primary term is expected to be positive and the coefficient of quadratic term is expected to be negative. The descriptive statistics of the variables used for the estimates are shown in Table 1, and the estimation results are shown in Table 2. A fixed-effects model was adopted using the Hausman test. 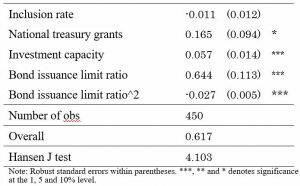 According to Doi and Bessho(2005) and Bessho(2008), the inclusion rate and national treasury grants may be endogenous. So the two-period lag variables of these explanatory variables are used as the instruments. The estimation results are shown in Table 3. The following points can be discerned from the estimation results in this table. The coefficient of the inclusion rate is negative, but not significant. The coefficient of the national treasury grants is significantly positive at the 10% level. This can be interpreted as showing that when the national treasury grants increase, the value of road bonds approved also increases. This is because specified projects are a combination of subsidized projects and non-subsidized projects. The coefficient of the investment capacity is significantly positive at the 1% level. This can be interpreted as indicating that when financial resources increase, the value of road bonds approved also increases. The bond issuance limit ratio’s primary term is significantly positive, and the quadratic term is significantly negative at the 1% level. 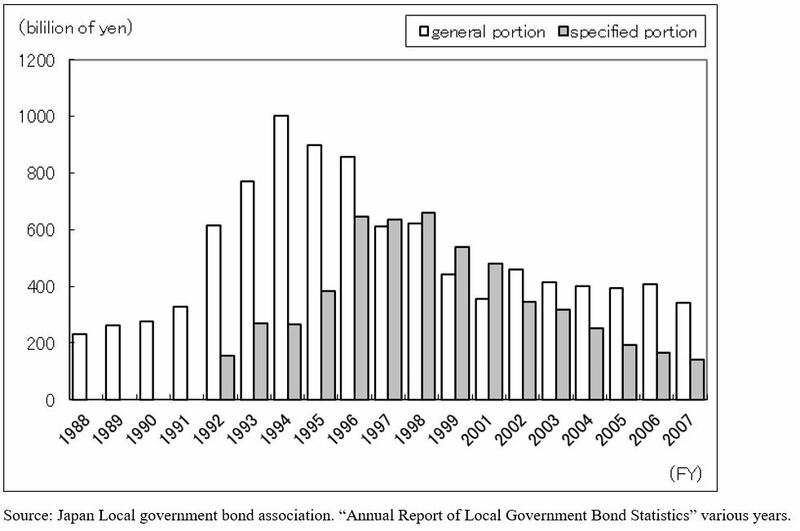 As Nakano (2000) found, this can be interpreted as signifying that when the bond issuance limit ratio reaches a certain level, the value of road bonds approved decreases. The fact that local governments change the value of road bonds approved, according to their financial condition, shows that local governments’ spending is not completely controlled by the central government. In this study, we focused on the relationship between the issue of road bonds and the inclusion rate, using data on prefectural road bonds’ approved value. The following findings were obtained. First, the coefficient of the inclusion rate is negative, but not significant. Second, the coefficient of the national treasury grants is significantly positive. This can be interpreted as showing that when the national treasury grants increase, the value of road bonds approved also increases. Third, the coefficient of the investment capacity is significantly positive. This shows that when financial resources increase, the value of road bonds approved also increases. Fourth, the coefficient of the bond issuance limit ratio’s primary term is significantly positive and the quadratic term is significantly negative. We observed that when the bond issuance limit ratio reaches a certain level, the value of road bonds approved decreases. Based on the findings of this study and in contrast with the findings of previous research, road bonds were linked to national treasury grants because specified projects combined subsidized projects and non-subsidized projects. Therefore, as a factor behind the issuance of road bonds, rather than the local allocation tax measures, the linkage of subsidized works had an effect. Reconstitutive downward causation by Geoffrey Hodgson can be attributed to these results. Because the central government had appealed to the prefectural governments strongly with the national treasury grants. Lower-levels governments are restrained and act in conformity with the power of higher-level government. As we mentioned earlier, prefectural spending isn’t completely controlled by the central government. But Japanese local governments have tended to choose subsidized works, because the standardized local tax system in Japan restricts the local governments from increasing tax revenues on their own. So, in effect their revenues have been limited. Therefore, it can be said that the institutions which are produced by the central government affect the propensities of the local governments. As aforementioned, non-subsidized works were conducted by local governments at their expense and road bonds were issued for non-subsidized works. However, the national treasury grants affect the behaviors of local governments. Because the specified projects were implemented as a combination of subsidized works and non-subsidized works. Coronado, J. (1999) Tax Exemption and State Capital Spending. National Tax Journal Vol.52 (3), pp.473-481. [i] National treasury grants are specific grants. [ii] Hirashima and Ueda (2001), pp.417-421. [iv] Minister’s Secretariat Accounting Division, Ministry of Construction (1992), p.68. 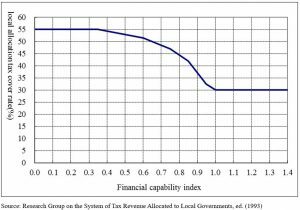 [v] The local allocation tax cover rate was calculated based on the following formulas: (source: Research Group on the System of Tax Revenue Allocated to Local Governments (1993)). * X is the financial capability index. When α is less than 0.300, it is considered to be 0.300, and when it is more than 0.550, it is considered to be 0.550.